← Why Keep Including India When Comparing US with China Greenhouse Gas Emissions? We compare the price, fuel economy, cost and mileage range of a Honda Civic Natural Gas car with a gasoline Honda Civic, a Honda Civic Hybrid, and the Toyota Prius Hybrid. The table is formed from www.fueleconomy.gov, from the Department of Energy. First, in price, the Honda Civic Natural Gas starts at $8,450 more than the Honda Civic gasoline, which is 46% more. Of course, it may come with a lot more than standard equipment, since the high end listing is only $4,800 more. The Honda Civic Hybrid is $6,445 more than the gasoline basic one, but only $2,845 more at the high end. The Toyota Prius Hybrid is $6,010 more than the Honda Civic gas at the low end, and $5,515 more at the high end. The fuel economy comparison that I would like would be in Greenhouse Gas Pollution per year per vehicle. CARB, California Air Resources Board states that on a lifecycle analysis, Natural Gas vehicles will produce 28% less CO2 equivalent greenhouse gases. Natural Gas also almost eliminates the nitrogen oxides that causes smog, the volatile organic compounds, carbon monoxide, and sulfur dioxides. The key users of natural gas vehicles are Pakistan and large cities in India. Here, I will use the annual cost for 15,000 miles driven given in the table we are analyzing. I of course like to point out that you can cut the fuel cost in half, a third, or a fourth by carpooling. For the Honda Civic gasoline, it cost $1,400 to drive 15,000 miles in a year. If after five years its fuel savings over an average car is $3,000, the average car must spend $600 more per year, or a total of $2,000 per year. The Honda Civic Natural Gas has a yearly fuel cost of $1,050 compared to the Honda Civic gasoline at $1,400, or savings of $350 a year. The natural question is how many years does it take to break even over the $8,450 basic price? The answer is 24 years (gulp). For the high end vehicles, the $4,800 difference takes almost 14 years. 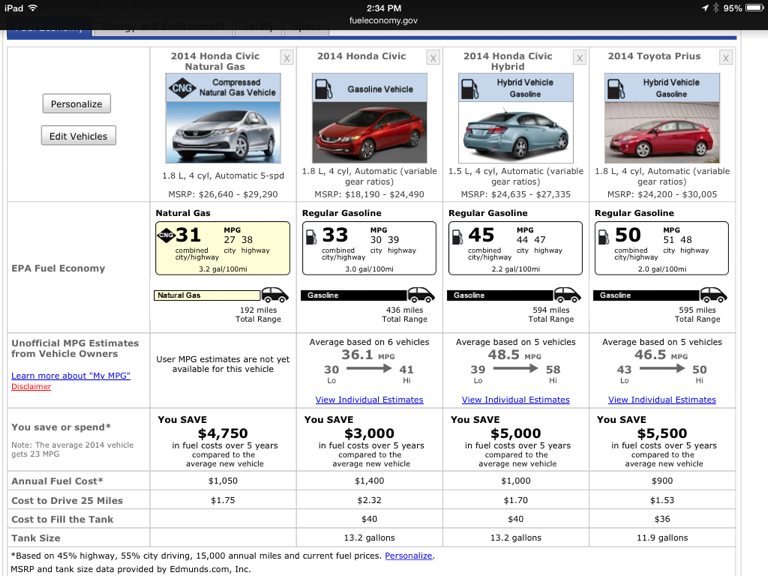 Now we compare the Honda Civic Hybrid car with the gasoline Honda Civic and the Honda Civic Natural Gas. The Honda Civic Hybrid costs $6,445 over the Honda Civic gas, yet is $2,005 less than the Honda Civic Natural Gas. The Hybrid uses 2.2 gallons of gas per 100 miles, while the gasoline Civic uses 3.0 gallons per 100 miles. Taking the ratio 2.2/3.0 = 0.73, so the Hybrid saves 27% of pollution of all types over the gasoline Civic. That is almost the same as the 28% CO2 pollution savings of the Natural Gas model over the gasoline version. Of course the greater Hybrid advantages are that you do not have to search out a natural gas station, and get 600 miles per tankful, rather than less than 200 miles in the Natural Gas version. Still comparing the fuel cost savings of the Hybrid Civic over the gas model, is a savings of $2,000 over five years, or $400 a year. To break even with the $6,445 price difference will take 16 years. The price difference of the top end of the Hybrid over the gas model is $2,845. It would take 7 years to break even on that. Finally, we compare with the popular Toyota Prius Hybrid. Its base cost is about the same as the Honda Civic Hybrid. Its savings over the Honda Civic gas is $500 a year. It uses only 2.0 gallons per hundred miles instead of 3.0, which is a savings of 33% of all type of pollution over the gas model. It is always surprising that if you increase from 33 mpg to 50 mpg, an increase of 52% in mpg, since the pollution is proportional to the inverse of mpg, or gallons per mile or hundred mile, that the pollution is reduced by the smaller number 33%. The price of the Toyota Prius is $6,010 more than the gasoline basic Honda Civic. At a gas cost savings of $500 a year, it would pay for the increase in 12 years. The Prius also has a 600 mile gas tank range, like the Honda Civic Hybrid. Of course, people buy the lower pollution vehicles to help the environment, which is commendable, not just for the savings in gasoline. This entry was posted in Autos, Conservation, Energy Efficiency, Fossil Fuel Energy, Greenhouse Gas Emissions, Natural Gas, Osher Lifelong Learning Institutes, Transportation. Bookmark the permalink.